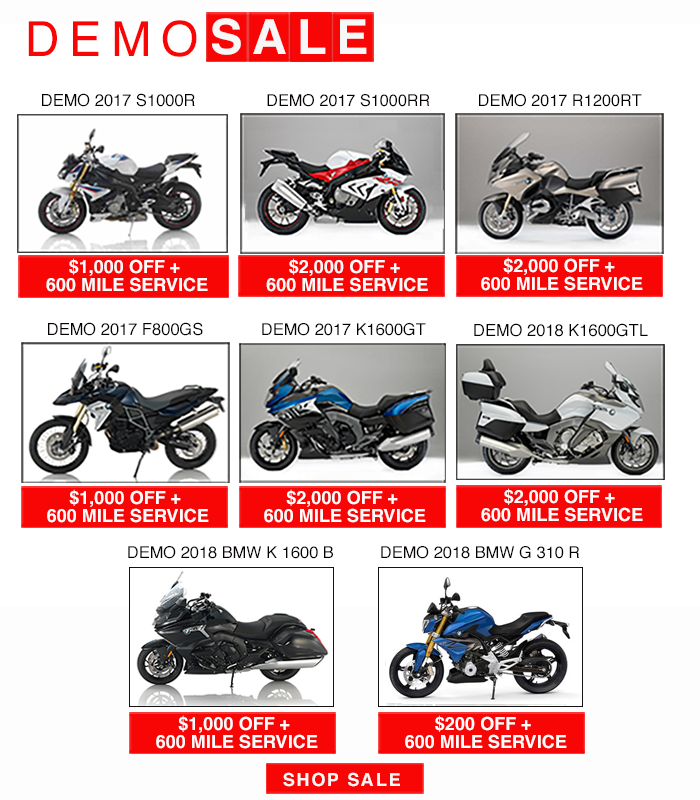 2018 BMW Motorcycles Now Available! New 2018 models are arriving daily! Call Bob’s BMW to reserve yours TODAY! 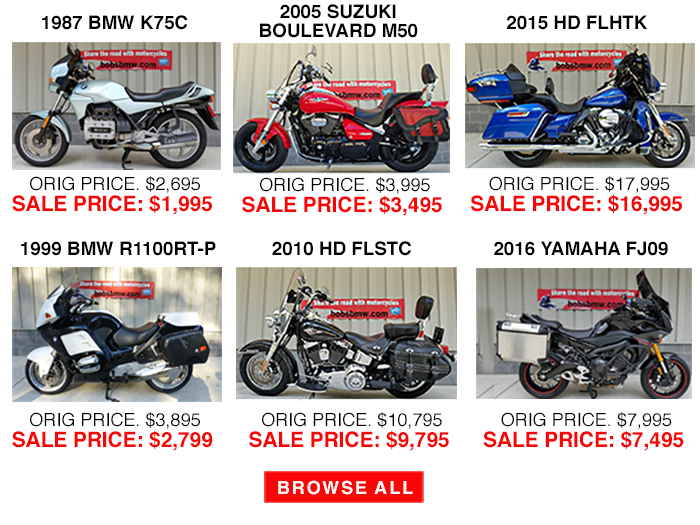 Up to $750 OFF new BMW motorcycles if you are an active Emergency Services member! In appreciation for the commitment and sacrifice of our men and women providing emergency services to our communities, BMW Mottorad USA is pleased to announce this special motorcycle purchase program with savings up to $750 off a new BMW motorcycle! An Emergency Services employee must be employed as a recognized Public Authority at the time of the motorcycle delivery. A Public Authority is considered to be a Federal, State or Local Police Agency / Authority, Sheriff’s Department, FBI, DEA, NSA, US Border Patrol, DA, Port Authority Police, US Coast Guard, Fire Department / EMT (including both paid and active volunteer), US Public Health Services, NOAA, etc. Ask your sales associate for details. Call 1.888.BMW.BOBS or 301.497.8949 to find out more about this program. LET’S TALK TODAY! This incentive may be combined with any other retail customer incentive* available at the time of purchase for a qualified model (unless specifically excluded in the incentive program rules), which is defined as any new, previously unregistered BMW motorcycle sold between the dates of January 1, 2017 through December 31, 2017. BMW Motorrad fleet, HP4 models, auction or official P2 dealer demonstrator units do not qualify.May not be combined with Center Employee, BMW MOA / BMWRA / VBMWMO Club Offers, MSF Instructor, Ride Smart Rewards, Military or BMW Group Employee / Valued Vendor Purchase Programs. Motorcycles must be purchased through an authorized BMW Motorrad USA dealer, such as Bob’s BMW.BMW Motorrad USA reserves the right to make changes to the Program and/or terminate the Program at any time without prior notice. Up to $750 OFF new BMW motorcycles if you are an active members of the US Armed Forces! In appreciation for the commitment and sacrifice of our men and women providing serving the US armed forces, BMW Mottorad USA is pleased to announce this special motorcycle purchase program with savings up to $750 off a new BMW motorcycle to qualifying individuals. *HP4 model is not eligible. Active members include active duty (including activated Reservists) of the U.S. Air force, Army, Navy, Marines, National Guard, Coast Guard, Veterans Administration and those who have recently finished active service (within 12 months) with a current military identification card or are a key military contractor. A copy of Department of Defense form 214 may be necessary for those who recently have been discharged from active service. Ask your sales representative for details. Call 1.888.BMW.BOBS or 301.497.8949 TODAY. LET’S TALK TODAY! 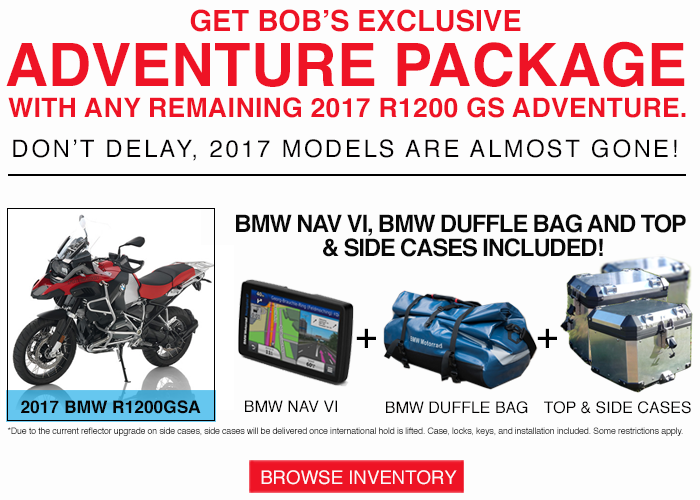 This incentive may be combined with any other retail customer incentive* available at the time of purchase for a qualified model (unless specifically excluded in the incentive program rules), which is defined as any new, previously unregistered BMW motorcycle sold between the dates of January 1st – March 31st, 2017. BMW Motorrad fleet, HP4 models, auction or official P2 dealer demonstrator units do not qualify. *May not be combined with Center Employee, BMW MOA / BMWRA / VBMWMO Club Offers, MSF Instructor, Ride Smart Rewards, Emergency Services or BMW Group Employee / Valued Vendor Purchase Programs. Motorcycles must be purchased through an authorized BMW Motorrad USA dealer like Bob’s BMW! BMW Motorrad USA reserves the right to make changes to the Program and/or terminate the Program at any time without prior notice. RECEIVE $500 IN BMW RIDERS’ APPAREL! BMW Motorrad is please to announce, any new or returning rider that is a recent graduate of the Motorcycle Safety Foundation (MSF) Basic RiderCourse will receive $500 in BMW Riders’ Apparel with the purchase of any new BMW motorcycle! 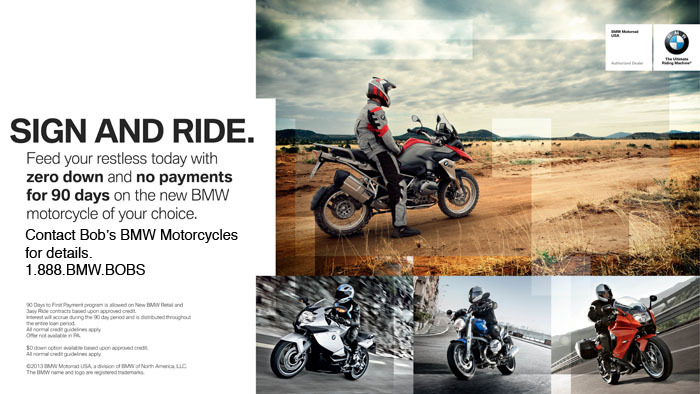 This incentive may be combined with any other retail customer incentive* available at the time of purchase for a qualified model (unless specifically excluded in the incentive program rules), which is defined as any new, previously unregistered BMW motorcycle sold between the dates of January 6, 2017 through December 31, 2017. MSF Basic RiderCourse graduates must prove the course was completed within the previous 90 days. Certificate must be dated. Qualifying apparel includes original BMW Riders’ Apparel from the BMW Mottorad Ride catalog. BMW Motorrad fleet, HP4 models, auction or official P2 dealer demonstrator units do not qualify. *May not be combined with other special purchase programs including BMW MOA / BMWRA / VBMWMO Club Offers, Military, Emergency Services, MSF Instructor, BMW Group Employee / Center Employee or Valued Vendor Purchase Programs. Motorcycles must be purchased through an authorized BMW Motorrad USA dealer like Bob’s BMW! BMW Motorrad USA reserves the right to make changes to the Program and/or terminate the Program at any time without prior notice. Up to $750 OFF new BMW motorcycles if you are an active Motorcycle Safety Foundation Certified Rider Coach!All active MSF Rider Coaches currently registered with the MSF are eligible for an allowance up to $750 on any new BMW motorcycle! Call (1.888.BMW.BOBS or 301.497.8949) to find out more about this program. LET’S TALK TODAY! LOW MONTHLY PAYMENTS. $0 DOWN OPTION. NO PAYMENT FOR 90 DAYS. Call 1.888.BMW.BOBS or 301.497.8949 to see if you qualify for BMW 3asy Finance. LET’S TALK TODAY! $0 down option available based upon approved credit. Interest will accrue during the 90 day period and is distributed throughout the entire loan period. All normal credit guidelines apply. Offer not available in PA. 90 days to first payment is allowed on New BMW Retail and 3asy Ride contracts based upon approved credit.